The Leamington Portland cement plant straddles Highway 132 in eastern Juab County. Martin Marietta Corporation completed construction of this 650,000 ton-per-year plant in 1980 to supply cement for the proposed MX missile program. The U.S. Government later scrapped plans for the MX system but there was enough regional construction to justify operating the plant. Martin Marietta produced the first cement on November 15, 1981, and ran the plant until April 1984. Southwestern Portland Cement ran the plant from April 1984 until it was purchased in May 1989 by Ash Grove Cement Company, headquartered in Overland Park, Kansas. Ash Grove increased plant capacity to 850,000 tons per year in 1995-96. While most of the U.S. cement producers are foreign owned, Ash Grove is currently the largest domestically owned Portland cement company in the United States, operating nine plants. Portland cement is a finely ground powder which is mixed with water to form a paste which hardens over time to bind aggregate (crushed stone or sand and gravel) together to form concrete. The term Portland cement was first used in 1824 by Joseph Aspdin, an English stone mason, to describe a new cement formula that he had patented. Mr. Aspdin thought that his cement resembled a well-known limestone building stone quarried on the British Isle of Portland. Portland cement is typically made from (1) limestone, (2) a source of silica like sandstone or quartzite, (3) a source of alumina like shale, clay, or bauxite, (4) iron ore or industrial by-product iron, and (5) gypsum. Portland cement is one of the most important building materials in the world. In 2001, the U.S. Geological Survey reported that 116 U.S. cement plants produced 85 million tons of Portland cement for construction of buildings, bridges, highways, and other structures. 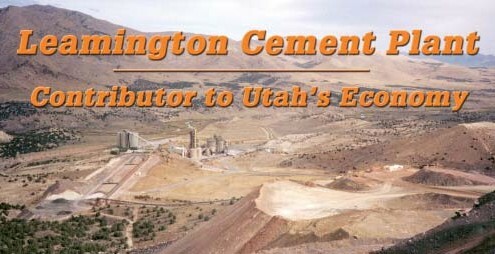 Cement production by Utah’s two cement companies contributes to Utah’s commercial, residential, and infrastructure growth. 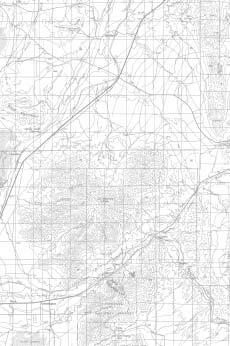 Most of the huge amount of concrete used for Interstate Highway 15 reconstruction in the Salt Lake City area incorporated Portland cement made at Leamington. On a poundfor- pound basis, more of it was used on this job than any other structural material. The Leamington plant uses limestone, shale, and sandstone mined at three separate quarries. In 2002, the plant mined one million tons of limestone from the Cambrian Swasey Limestone at the Leamington quarry, 100,000 tons of shale from the Mississippian Long Trail Shale Member of the Great Blue Limestone at the County Canyon Quarry, and 75,000 tons of sandstone from the Permian Diamond Creek Sandstone at the Nielson quarry. The Leamington quarry is drilled and blasted five or six times a year. A typical blast produces about 250,000 tons of limestone. A large front-end loader picks up broken limestone and loads it into haul trucks which move it to the primary, single-pass hammer-mill crusher. Here it is reduced to softball size or smaller. The primary crushed limestone is transported by conveyer belt to a stacker/reclaimer. A 25,000-ton pile is made once per week. Raw material from the County Canyon quarry and the Nielson quarry is also reduced in size and transported to the plant by dump trucks. Limestone, shale, and sandstone are placed in five storage silos at the plant. Limestone, shale, sandstone, and mill scale (an industrial by-product iron powder from Geneva or Nucor Steel) are mixed in precise proportions through the use of continuous X-ray fluorescence chemical analysis. The proportioned materials are then moved to a mill which pulverizes the raw materials to the consistency of talcum powder. Hot rotary kiln exhaust gas sweeps the mill, drying the raw material and moving it to two blend silos. 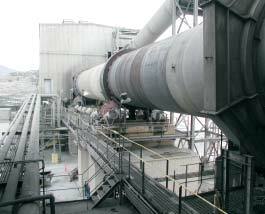 Pulverized raw material from the blend silos is then transported for pyro-processing in the preheater/calciner tower and rotary cement kiln. The 268-foot-tall tower has six vessels, including the calciner vessel; the calciner burns about 60 percent of the fuel (powdered coal) used at the plant to heat the raw material to 1,481 degrees Fahrenheit to calcine the limestone (remove the carbon dioxide). The calcined product then goes into a rotary kiln where additional fuel is burned to heat the calcined material to the point of incipient fusion at a white-hot temperature of approximately 2,650 degrees Fahrenheit. The rotary kiln is 12.5 feet in diameter, 175 feet long, and turns at 3.5 revolutions a minute. Heating produces an equilibrium between the solid and liquid phases of the cement compounds that are produced. The resultant crystalline material is now called Portland cement clinker. The control room operator maintains the proper reaction temperature by varying the amount of fuel going into the kiln. The plant consumes about 100,000 tons of Utah coal per year from the Crandall Canyon mine. Leamington is very energy efficient and requires only about 3.05 million Btu per ton of clinker produced. Part of the efficiency is due to the use of hot kiln exhaust gas to dry and preheat incoming raw materials. The hot clinker is cooled and transported, along with five to six percent gypsum, into a 14-foot-diameter ball mill driven by a 5,700 horsepower motor. The gypsum slows the hardening time of the concrete made with Portland cement. About 40,000 tons per year of Utah gypsum is currently purchased from H.E. Davis Construction, Inc. who mines gypsum from the Jurassic Arapien Shale near Levan. The clinker and gypsum are ground to a fine gray powder. The cooled product is then transported to the shipping silos for distribution by truck (80 percent) or train (20 percent) throughout the state and region. The main market for cement from the Leamington plant is the Salt Lake City area with a distribution terminal in Murray, Utah. Secondary markets in Nevada and New Mexico are served from terminals in Elko and Las Vegas, Nevada and Farmington, New Mexico. Leamington produced 834,000 tons of finished cement in 2002.